$85 DOT Physical Exam | Roseville, California 95661 | No Waiting! Recognized by OOIDA for Driver Helpful® CDL Physical Exams. OOIDA Member Discount! Nationally Recognized as a Provider of Fair, Ethical DOT Physical Exams! Need your DOT Physical Exam Today? We know your time is valuable! We have two National Registry Certified Medical Examiners in our office so we can usually get you in fast.. We make every effort to provide Same day appointments, but most appointments are within one day or less. Just give us a call at 916-781-7878! In most cases, the physical exam and the needed paperwork is complete in less than an hour from walking in the door. Erickson Chiropractic Clinic opened in 1990. Our office is bilingual (Se habla Espanol). As well as being a National Registry Certified Medical Examiner. Additional services available at Erickson Chiropractic include work and auto injuries. With their extensive knowledge of the DOT Physical exam medical guidelines, let Dr. Erickson & Dr. Fink steer you through the DOT physical exam requirements so you can Keep on Truckin’. Looking for a DOT Physical Exam, CDL Physical Exam, or a School Bus Physical in Roseville, CA? You’ve come to the right place! Mon-Fri: 8:30am-5:30pm, Immediate appointments available for drivers! Saturdays available by appointment! Roseville Location: We are on the corner of Cirby Way and Sunrise Blvd, in Cirby-Sunrise Professional Center, across from the Bel Air Shopping Center. We are 5 minutes from Highway 80 Riverside/Roseville exit. 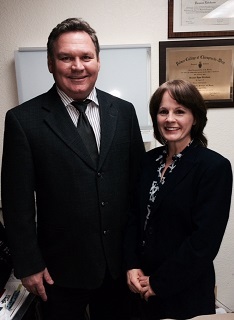 Dr. Erickson is a Certified Medical Examiner in the National Registry. She has been in clinical practice for 25+ years. She takes care of patients injured in auto accidents or at work. Dr. Richard Fink is a Certified Medical Examiner in the National Registry. Board-certified chiropractic orthopedist; In private practice since 1990.